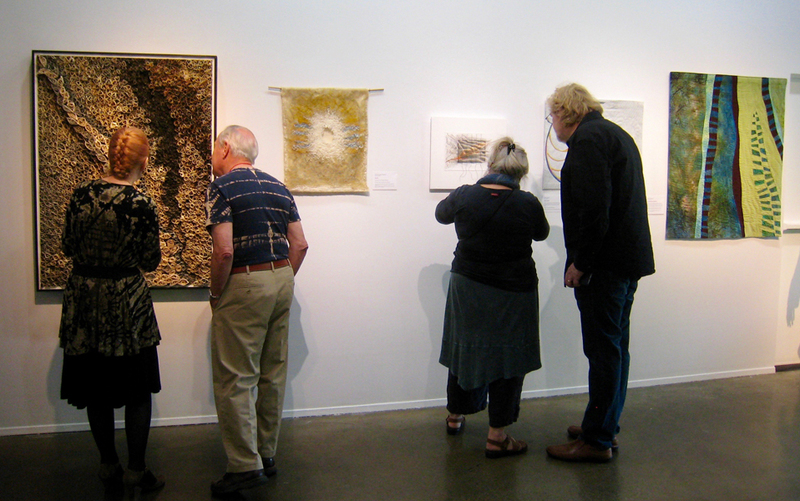 We were excited to create a group show at the Port Angeles Fine Arts Center. A call was put out for all SDA-NP members to participate with one or two pieces for FIBE(R)evolution. The range of materials and methods as well as the quality of work, represent our group well with 39 pieces by 26 artists. In May of 2016 I had a show at the Northwind Arts Center in Port Townsend, Washington. At the opening reception, music was provided by Bertram Levy, a bandoneon player. My husband Ron Gentry took a picture that perfectly captured the joy of this musician as he played. Later we saw Bertram Levy in concert with his group Tangoheart and learned that the bandoneon is a very challenging instrument, developed in Argentina, and used to create music for the tango. I created the composition for this quilt to complement the image of the musician. The shadow of a couple dancing the tango, suggests that they may be somewhere else in the same room. I changed the colors of the shirt and foot rest to red to make the overall design more balanced. The figure of the musician and his chair were enlarged and laser printed on fabric. All of the other fabrics in the quilt are from the various collections of fabric that I have designed for Benartex. The quilting was done with many different colors of thread. The vine pattern on the far upper left side echoes the decorative motif on the end of the bandoneon. Linda Carlson combines conventional patterns and techniques with nontraditional materials. A baby sweater knitting pattern served as the inspiration for this piece, which uses copper wire salvaged from an electronics factory. Dropped stitches and the inconsistent tension common with the wire's gauge are incorporated, along with beads left from an interior designer's samples. For additional texture, the selvage of the linen (also a designer showroom sample), was saved. A photo I took in Hawaii and decided to create a fabric art piece. The Clam Cannery in Port Townsend WA was built in 1885 and renovated in 2006. The the NE side door has a copper surround and is photographed frequently. I decided to photograph the door, modify the color and create a collage art piece. "Luminous Strata" explores varied nuances of color, shape, and texture. A sunset over the sea inspired me as I stood on the shore. I analyze designs at a microscopic level. Then I create new designs that encircle, spiral, branch, and wander to simulate an imaginary universe. My intention is to work sculpturally with the natural fibers of these animals; keeping the basic form of their fibers close to how they grow. Focusing: one of my biggest challenges. This is my interpretation of a bright colored spinnaker sail deployed, or flying. It is sometimes called a kite or parachute. Fabric is hand dyed. The quilt is then sandwiched: top, batting, and backing. Design is stitched, then painted using fabric paints, and the entire quilt free-motion quilted. It's fall and time for a road trip! In the fall, it's time for a road trip! This shawl was created with a bit more weightiness to it so that it feels as if you are being surrounded and protected by its covering. The botanical imprints on the shawl are from plants carefully gathered with the hope of having the plant's energy embracing you when worn. Evidenced by small cartoon teeth, the base was a reminder card from my dentist (the top ten reasons patients miss their appointments). Selecting words and images from food and non-food product packaging, I collaged and sewed on reasons for loving someone. Losing count, I ended up with 20 reasons, give or take. Fifth in a series of small collages made from paperboard packaging (and other cast-off paper elements). Intended to be read from bottom to top, I reflect on the horror of cancer and celebrate the hope of recovery. From negativity surrounding diagnosis and four surgical sites (“open here”), emerge words of gratitude, columnar meditations on life & self, and things I Iove depicted at heart center, anchoring my emergence (in the form of butterflies). Fourth in my ongoing Torsos series. An exploration of the perception of color and shape when the same color is placed on varying backgrounds. My revolutionary expression is a vision of our planet beginning to spin out of control from internal and external forces: global warming, war, hate & the cosmos. Gaia is cradled in a copper hand basket; her core shines with hope. Have been exploring seeds and their importance in humanity's sustainability. This piece evokes a female form reclining, ready to give to all. I made this piece to show off the sumptuous hand-dyed fabric made by my friend, Mary Tyler, who's also an SDA member. The blues, greens, and browns remind me of the deep sea and the upwelling upon which our lives depend. This piece highlights two things I'm interested in - texture and reflection. The see-through organza fabrics allow me to layer and crimp and contour, while the ones made of "shot" cloth (where the warp fibers of the weave are one color while the weft fibers are a different color) create shifting patterns of color depending on how the light hits their surface. The piece of art was inspired by my daughter-in-law, a Marine Biologist at Kokonut Island, Kaneohe Bay, HI. Periodically she send me tidbits of information and pictures from her studies and the people she meets. The Violet Sea Snail, a very tiny - about half of my baby fingernail - tropical creature that sails in the Pacific Ocean using the bubbles it creates to catch the wind. This beautifully colored snail is sailing in more northerly waters, off the coast of northern California, as northern Pacific waters warm. I took the picture of these empty shells in April, 2017 when I visited this year. Needless to say my sea snails are only in scale if you imagine my small chunk of ocean as very, very large. Technique: Layers of sheer organza and painted newspaper stitched to heavy weight painted Pellon, cut, shredded with a wire brush and melted, painted Lutradure attached to a canvas frame; stitched. Covered cording, coiled, stitched, painted and formed into a cone with coiled bottom, painted and stitched to the background along with glass "bubbles." Why must quilted art be rectangular and two dimensional? I wanted to move the medium from a static shape to a more active one and one which moves through forms. Quilts can be any shape and hang in space. The backs are often as interesting as the fronts but they're hidden, a secret space. Here is the back as well as the front of a quilted piece. This piece is the first in a series which began during a workshop with Maria Shell. It was created with a different approach than my usual improvisational work. After enlarging a traditional quilt block, I used strip piecing techniques to begin filling the areas with new patchwork. The forest restores my soul. I escape to the Olympics to breathe. This is a favorite hike (Royal Basin) that passes through particularly beautiful sections of forest with an understory covered with rolling hills of moss. Technique: The primary piece was handwoven using a technique called doubleweave. Two layers are woven at one time, with the layers interleaving, in this case, to create the path through the woods. The back layer is wool, and shrank when the piece was washed, creating the gentle valleys of the foreground. The small trees are created using a technique called ply-split braiding. I love watching the wild rivers in the Olympics. In the smoother flowing eddies, I see more subtle evidence of the turbulence in the small whirlpools that develop and flow by. Technique: All of the pieces were handwoven on a 4-shaft loom. Using a technique called doubleweave, where two layers of cloth are woven at the same time, I created tubes of fine threads and then worked with them off of the loom to create these shapes. Inspired during a walk at low tide, I took photographs of amazing patterns of sand and seaweed left behind by the receding water. In this piece I'm seeking to enhance the textures by drawing and stitching over the photograph, and incorporate the sense of woven structures. This piece was necessitated by our current administration and my need to respond creatively with a trip down "Alice's" rabbit hole. The words discharged from the indigo fabric are from Alice in Wonderland, while the players are recognizable both from the book and from our current administration. While making this piece I was imagining the underground networks of roots and fungi working together in the forest; reminding me of the interconnectedness of all beings above and below the ground.